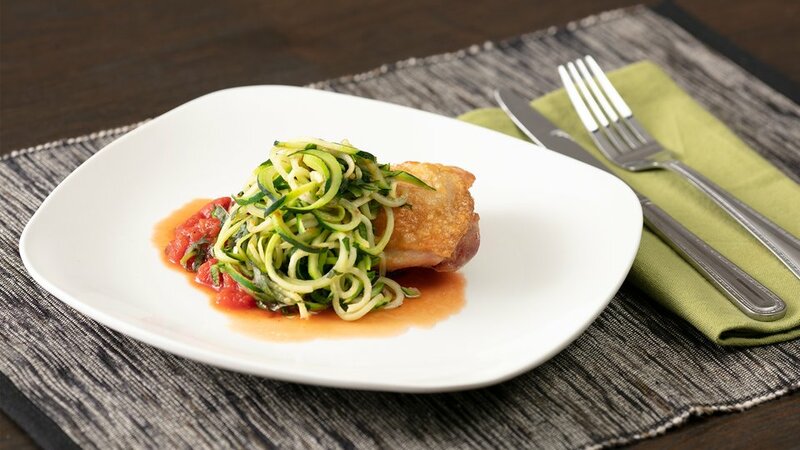 Zucchini noodles or "zoodles" are a low-carb, low-calorie alternative to pasta and a great side dish on their own. Chicken thighs have more fat and therefore more flavor than chicken breasts, but either works for this recipe. You can use canned crushed tomatoes for the sauce, and many stores now sell pre-spiralized zoodles so you can whip up this light and healthy meal in no time. Season the chicken thighs with salt and pepper, and sear in a skillet on medium-high heat. Cook on each side for 5-6 minutes depending on size. Once cooked through, remove from heat and set aside to cool. While chicken is cooking, heat olive oil in a saucepan on low to medium heat and add the garlic and crushed red pepper. Once the garlic begins to brown slightly, add the crushed tomatoes. Bring to a simmer, then remove from heat and add chopped basil. Heat zucchini noodles in a sauté pan with just a little bit of water, cooking for 3-4 minutes until tender. Drain zoodles and serve with tomato sauce and chicken thighs.